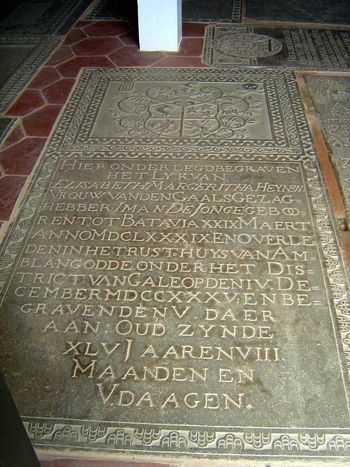 "Hereunder lies the body of Elizabeth Margaret Heynen, wife of the Gezaghebber of Galle, Imam de Jonge. Born at Batavia, 29th March 1689, and died at the resthouse at Amblangodde, in the District of Galle, on the 4th December, 1735, and buried on the 5th. Aged 45 years, 8 months, and 5 days."